Over 44 years ago, Leopold Stokowski conducted the first North American performance of the Symphony No. 11 by Shostakovich. Stokowski was then music director of the Houston Symphony Orchestra (HSO) and had already conducted a number of important Shostakovich (photo: right) premieres. Around the time of those 1958 performances of Symphony No. 11, Stokowski and the HSO also made the first commercial recording of the piece. 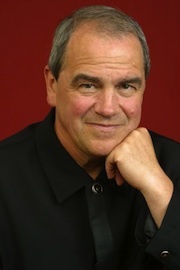 Hans Graf, the current music director of the Houston Symphony, is making news again with this Shostakovich masterwork. The May 3rd HSO program paired Symphony No. 11 with one of the composer’s lesser known works, the Anti-Formalist Rayok. A few days later Graf took this same program to New York’s Carnegie Hall, and on June 9th of this year the Houston Symphony, with Graf conducting this same program, will be featured in the “Festival of the World’s Symphony Orchestras” in Moscow – the first American Orchestra ever to be invited to perform at this event. Maestro Graf’s (photo: below right) Houston concert opened with a rarity; Anti-Formalist Rayok is a piece that Shostakovich wrote for the private amusement of his friends in reaction to government heavy-handedness. In 1936 Shostakovich's opera Lady Macbeth of the Mtsensk District had been condemned as "immoral," and in 1948 he was denounced again at the First Congress of USSR Composers. The charge was “formalism.” The Soviet authorities held the view that all music should serve the ideals of communism, which meant that it should draw on “folk” or “popular” music, it should avoid anything critical of the government, and it should be music that is easily understood by the masses. Obviously, music that is excessively dissonant or complex was unacceptable. The seriousness of these issues cannot be underestimated. Many artists of the period, and some of Shostakovich’s closest friends, were not only denounced but often rendered unemployable, beaten, sent to labour camps or even murdered. Anti-Formalist Rayok, a slight piece but vitally important to understanding the composer and his times, was given its first public performance in Washington in 1989, fourteen years after Shostakovich had passed away. The conductor was Mstislav Rostropovich, one of Shostakovich’s longtime friends and a fervent champion of his music. In Houston, Hans Graf gave Rayok a first-class performance, featuring the excellent and entertaining bass Mikhail Svetlov, (photo: below right)who literally “changed hats” to portray all three government officials lampooned in the piece. Stalin himself was one of these and we can only imagine what the composer’s fate would have been, had the piece been performed publically in his lifetime. 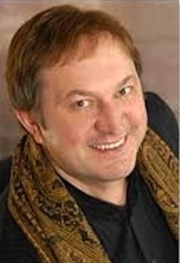 Svetlov sang and acted with power and comic skill. Shostakovich wrote the piece with piano accompaniment only, but in Houston we heard a version for chamber orchestra by Milman. In this version, the bass soloist is joined by a chorus whose role is basically to reinforce the party line espoused by the lead characters. 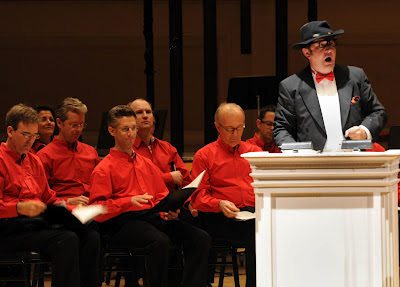 Having decided that professional singers would produce an overly polished sound, Maestro Graf chose instead to use members of the Houston Symphony for the chorus, dressing them in red shirts for the occasion. They rendered their conformist interjections with great enthusiasm! The performance of Anti-Formalist Rayok was greatly enhanced by the use of historical projections on a screen behind the performers. The younger members of the audience – and there were many in Jones Hall for this concert – probably benefitted as much, if not more than the rest of us, from these contextual visuals. After intermission came the Symphony No. 11, in a performance that was clearly well-rehearsed and extremely powerful. Shostakovich wrote this symphony four years after Stalin’s death, having outlived the ruthless dictator responsible for the deaths of millions of Soviet citizens. As of its composition in 1957, very little had changed in Soviet life and speaking out against the government was still very unhealthy. On the face of it, Symphony No. 11 would have been exactly what the authorities demanded from their composers. The program attached to it concerns the failed Russian revolution of 1905 in which workers and peasants staged a massive protest in front of the Winter Palace in St. Petersburg, demanding that the Tsar relieve their oppression and suffering. The Tsar answered by ordering his troops to massacre the defenseless protesters. As one digs a little deeper, however, it becomes apparent that there was more on the composer’s mind than the bloody events that led to the downfall of the Tsar and the coming of communism. 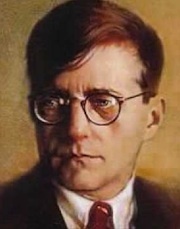 Shostakovich quotes prison songs in the symphony and those who knew Shostakovich personally claim that he was secretly sympathizing with the Hungarian victims of Soviet guns in 1956. Although I haven’t seen any conclusive evidence for this interpretation, in his Memoirs Shostakovich’s words about this symphony ring true. He recalls that he and his family often discussed the 1905 revolution and what it meant for the Russian people. The opening movement of Symphony No. 11 depicts the unearthly quiet in the Palace Square before the massacre. Graf and the Houston Symphony captured perfectly that unbearable calm before the storm. Then came the massacre in the second movement and the orchestra unleashed searing torrents of sound. Never have I heard the bass drum part executed with such devastating effect. In the third movement, the violas have music of heartbreaking beauty and the Houston Symphony players outdid themselves. The final bars were memorable too for the pealing of enormous “bells” at the back of the orchestra. I suspect that New Yorkers were duly impressed by the quality of the Houston Symphony and the authoritative leadership of Maestro Graf. And Moscow? Critics may say he's "bringing coals to Newcastle," but more thoughtful observers will see his all-Shostakovich program as a tribute to Russia and great Russian music. Those who know may also remind Russian listeners that it was the Houston Symphony that gave the North American premiere of this very symphony, and that Hans Graf himself studied conducting in Russia (St. Petersburg) early in his career. Music lovers outside Houston may not realize that under Hans Graf, the Houston Symphony has been making recordings on a regular basis; these deserve to be better known. Among the most recent are a CD recording of Mahler’s Das Lied von der Erde (Naxos 8.572498), and a DVD devoted to Holst’s The Planets with visual images from space assembled by Duncan Copp. The historic 1958 recording of the Symphony No. 11 by Stokowski and the Houston Symphony was recently re-mastered and re-released on CD by EMI. The Memoirs I quoted from in my review are perhaps better known as Testimony, the book compiled from the composer’s diaries by Soviet musicologist, Solomon Volkov. Although the authenticity of the book has been questioned over the years, it remains a valuable source of information about Shostakovich and his innermost thoughts and beliefs.